These agates are created from Brazilian geode thinly sliced to reveal a brilliant crystalline pattern. Traditionally revered for their metaphysical properties, no Brazilian Agates will ever look the same. Measuring approximately 4" in diameter, our Agate makes an excellent coaster or the perfect holder for our custom branded candles. Click here to be notified by email when Brazilian Agate Coaster becomes available. Founded in 2004, Water for Good is a leader in water development projects. Water for Good works in Central Africa Republic, one of the poorest countries on the globe. To date, Water for Good has drilled 650 new wells, rehabilitated 900 broken wells, and has a success rate of 91% of wells in working order. 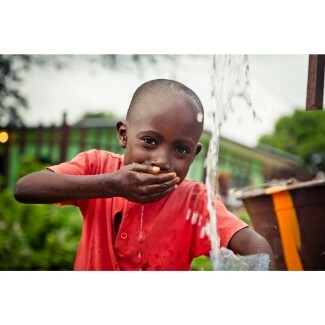 Your purchase today gives the gift of clean water for individuals in the Central African Republic.